Bodog.eu is a large online sportsbook that only accepts Canadian residents. Their sister site, Bovada.lv, accepts American bettors. This pair of sites will have the exact same odds and focuses solely on North American sports bettors. Bodog, along with Bet365 and Sports Interaction, are our recommended bookies for Canadian residents. Although Canadians are allowed to sign up at the majority of online sportsbooks worldwide, Bodog exclusively allows Canadians, while Sports Interaction targets all of their promotions towards Canada residents. The Bodog sportsbook has a wide variety of betting lines and is easy to navigate. Bodog also has a very strong poker room and casino, and will often entice players to try out the various verticals of their business through promotions. Click here to check out Bodog for yourself! New players receive a 100% first deposit matching bonus up to a maximum of $200. The bonus funds should be available in your account within 30 minutes of your deposit. You must rollover the initial deposit + free bet amount 5 times at the sportsbook before withdrawing. Bodog doesn’t have any ongoing sportsbook promotions at this time. They do offer several promotions though, but these are generally limited time. You can head to Bodog.eu to check out their poker or casino promotions, of which there are many. The limited time promotions often tie the sports betting in with the casino as well to entice you to try out the various branches of the Bodog business. Here is where the Bodog limited time promotions articles will go. Bodog offers a wide variety of betting options for the bigger North American sports such as football, baseball, basketball, hockey, soccer, tennis and MMA. That said they also take bets on some of the less popular sports such as golf, rugby, cricket, darts, snooker and more. Bodog, like Bovada, is one of the few sportsbooks we promote that takes their Poker and Casino businesses as seriously as their sports betting. The Bodog Poker room is one of the best online and shares players with Bovada. 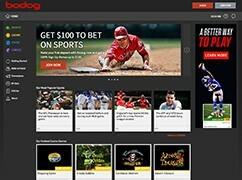 New Bodog Poker players receive a 100% sign up bonus up to $1000 on their first deposit. Bodog also gives a $600 casino bonus to new players. Both Bodog Poker and the Bodog Casino have a ton of other promotions that you can use to gain extra bonus chips. Click here to check out Bodog Poker or Casino. 24 hour phone support (1-877-263-6422), email and an extensive FAQ section.